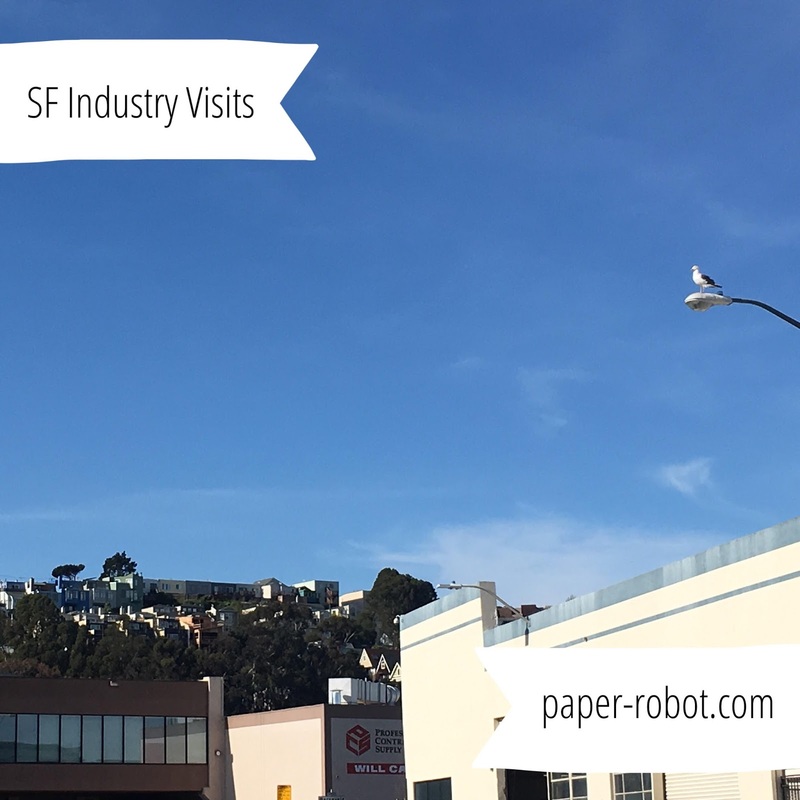 Two weeks ago, I posted the photos I took from my class industry visits in San Francisco, and since we're about to go visit some more places tomorrow, it seems fitting to finally post about the visits we made on February 5th. I also developed a lot of philosophical thoughts on the fashion industry, which accounts for the lengthy post! The world of sales representatives, from what I understand of it, is not the type of profession I could do. Lori Markman welcomed us into her superb showroom space (one of the last showrooms in the city! ), and explained a bit about her work. One of the things she said was that when we think of fashion, we think of flashy clothing and runways and beautiful models... But rarely do we ever consider that behind all the glitz and glamour is actually a really tough industry. Sales reps represent individual designers or brands, and connect the products to retailers. This process often happens during trade shows, which is where the tough stuff starts: lugging all the merchandise from show to show, and setting up booths, is extremely physically demanding. Low margins and ebbs and flows in business can make it difficult for independent reps such as herself to maintain extra staff to assist, too. Racks of clothes Lori literally put out the night before we visited, having just come from a trade show the day before. But apart from the physical labour required to maintain stock, product distribution is a different creature. Sales reps operate by "territory," meaning that one person represents one brand in one geographical area. For example, suppose you want to buy shoes made by Brand Name. Chances are, they have one person (either independent like Lori, or directly on the payroll) who communicates with and fosters relationships with all California retail stores that carry Brand Name shoes. Territory is a big deal in this industry, for a number of logistical reasons. It was very plain to me that this is not a career path I could ever see myself doing, but I can certainly appreciate the value of a good rep: a person with the perfect mix of social skills, determination, and the ability to match a retailer with the right selection of stock. After we left Lori Markman and the rather traditional world of the garment industry, we visited Betabrand, which originally started as a men's corduroy company, but has since evolved to a crowdsourcing model for many of their new designs. With their quirky advertising campaigns, the company remains largely focused on the male shopper, which allows them to break many unspoken industry rules. While most of the fashion industry operates on a per-season basis (e.g., Pre-Fall 2016, Fall 2016, Holiday 2016, etc. ), Betabrand is continuously coming out with new designs. All of their operations were online, until recently, and they now have a few physical stores, putting them in the "brick-and-click" category of shops. But what has worked well for them, particularly with the male audience, is the inclusion of consumers from concept through production. Normally, when you purchase a garment, the entire design, testing, and production process is hidden–maybe you see it on a ready-to-wear runway show, but you haven't seen the months of designs, sample garments, and apart from feeling guilty whenever a sweatshop makes the news, you don't think about the weeks it took to produce hundreds or thousands of garments, before you buy your one piece in a store. Betabrand has found that men, again in general, are willing to wait that process, and sometimes will forget that they ever made any such order, making for a pleasant surprise later on. Of course, everywhere we went, I was very interested in seeing their pattern design and creation area! After Betabrand, we went back into the realm of more traditional garment manufacturing, in a very uniform way (heh heh). Cayson Culinary Designs designs and manufactures uniforms for a very specific crowd: the food and service industry. Racks of chef's coats ready to go! These garments are designed here, and can be customized, but generally for large orders, and for culinary professionals. Cutting table, and look! A rack of patterns. I would certainly classify this as a niche business, but like having the right pots and knives to be able to cook properly, wearing the right clothing is important to protect your body and function well in the kitchen. This old school embroidery machine, which they've had for ages, uses FLOPPY DISKS. Chefs coats and aprons last anywhere between 6-8 months, before they need to be replaced, so it's definitely a lasting business. A point of interest, though: January and February are the slow months (since they're the slow months for restaurants also, post-holidays), and business starts to dwindle a bit. Throughout all our visits, I've noticed a trend: the fashion industry is almost like the canary in the coal mine, when it comes to general economic health. Supplying your restaurant (or yourself) with food to cook, and paying the rent, is always going to come before replacing your clothing. This is true whether you're in the kitchen or just you, at home. The manufacturing side of Cayson. It still amazes me how much is happening in the realm of fashion, which one normally does not or cannot see, as a regular consumer. Along with a greater understanding of how the garment industry works, I've developed a true appreciation for independent artists and even more so, small boutique shops. It can be a difficult way to earn a living, and it seems easy to burn out, but at the same time, it is extremely rewarding. Clothing allows us to publicly express a part of ourselves to others, whether we mean to or not (and choosing not to "care" is in itself an expression). Being a part of that choice, whether you are a designer, pattern maker, retailer, or anybody in between, is truly a great honour.